The May issue of the Adoremus Bulletin is now available to be read online. It’s another strong issue, with a tribute to Mother Angelica by Fr Jerry Pokorski, and great articles by Denis McNamara of the Liturgical Institute at Mundelein, Adam Bartlett of Illuminare Publications and the editorial team of Chris Carstens and Joe O'Brien. 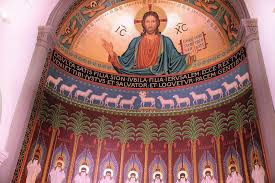 Joe’s article is an interesting piece on works of sacred art recently completed in Phoenix, which are painted in the Bueronese style.